Following up on the smash hit that was All About Ah-long, Johnnie To went back to television for a two-part film called The Iron Butterfly. I haven’t been able to track it down, but it looks to be a modern cop/Triad thriller, with Anthony Wong and Mark Cheng and action choreography by Yuen Bun, all of whom will resurface later in To’s career. His next theatrical feature was 1990’s Lunar New Year comedy The Fun, the Luck and the Tycoon, a loose remake of Eddie Murphy’s hit Coming to America that reunited To with Ah-long stars Chow Yun-fat and Sylvia Chang. While not the box office smash of To’s last two films with Chow, it was a financial success, but nonetheless was the last time the two stars would work with To until 2015’s Office. It’s an amiable film, lacking the hard, frankly unlikable, edge of To’s previous comedies, while at the same time demonstrating none of their daring. It’s the first truly ‘safe’ film he ever made. Chow plays the richest man in Hong Kong, a happy-go-lucky loon feeling imprisoned by his wealth and the marital expectations of his aunt. He’s betrothed to the daughter of the aunt’s best friend (an equally dotty dowager), played by Nina Li Chi as coutured giraffe with a bad attitude and worse conversation. He slips away and blends into the crowd at a charity banquet, where he is mistaken for a waiter. With a bemused curiosity, he plays along with the adventure that is customer service, finding himself gainfully employed by the restaurant doing the catering and smitten with the boss’ sister, played by Chang. As the only sane or halfway competent figure in the farce, Chang gets the least interesting role. She played the same likable figure at the heart of Seven Years Itch, but at least in that film she had some quirks (singing opera with her cousin) and even some whole scenes to herself, whereas here she’s just the decent, normal person. Every other character in the film is crazy, but mostly of the mild, heart-warming variety, some decent slapstick (including an impressive escalation of the hiding a person as a table gag from Yuen Woo-ping’s Donnie Yen breakdancing flick Mismatched Couples, matching it with the Marx Brothers’ stateroom), and none of the viciousness of The Eight Happiness. It’s Cinema City comedy (Raymond Wong again is the producer) at its most low-key and likable. Cross-class romance was an reliable basis for romantic comedy in 1980s Hong Kong, with Tsui Hark’s Working Class being a highlight of the cycle. As with both Ah-long and The Big Heat, pre-Handover emigration is again referenced, with Chow’s rival for Chang’s affection having the advantage of Canadian citizenship so that, when the time comes, she’ll be able to leave Hong Kong (and help get her brother out, he hopes). Chow goes through the film with a infectiously genuine smile: he’s game for everything, a person in love with the world, where every new discovery is delightful. While it borrows much of the plot and restaurant location from Coming to America, as well the gimmick of having Chow play multiple roles (he plays a very loud taxi driver in a couple of scenes and I think I spotted him as one or two other minor characters), the culture clash satire of that film is largely absent. Instead, The Fun might be seen more as an inversion of My Man Godfrey, where William Powell is thought to be homeless and hired as a butler by Carole Lombard, and proceeds to snidely critique the privileges and nonsense of the rich (which turns out to be a self-hatred as Powell himself is ultimately revealed to be wealthy) while falling in love with Lombard. Chow is rich and thought to be poor and gets hired into a family business, but rather than critique his new environment, he fully embraces its mundane charms. While he rejects the world he came from, he does it not from anger or political outrage, as Powell did, but out of boredom: sweeping floors and making food for people is simply more exciting to him than shopping for expensive jewelry. The fanciful life of the ultra-rich isn’t real enough for him: he longs for the authenticity of labor. Unlike in the La Cava film, or Tsui’s comedy, there’s nothing especially wrong with being rich: it isn’t a source of evil, it just isn’t tangible enough for Chow. For the rest of his time in Hong Kong before jumping to Hollywood, Chow would primarily be an action star, slowing his prodigious work ethic to a crawl. 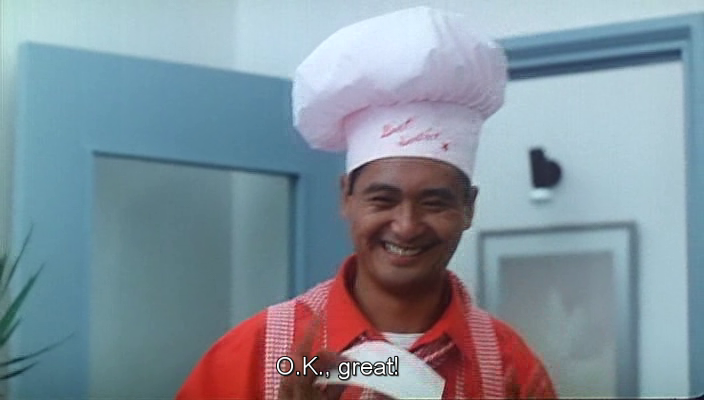 After averaging over eight films per year from 1986-1989, this was the only film Chow made in 1990, and he only made eight more films total before appearing with Mira Sorvino in Antoine Fuqua’s The Replacement Killers in 1998. Chang would continue to establish herself as a writer/director throughout the 1990s, making six films in-between small film roles and an occasional bigger role like the one in Ang Lee’s Eat Drink Man Woman. Credited as action director on the film (there’s an impressively designed fencing match as the movie begins) is Ching Siu-tung, who served in the same capacity on All About Ah-long. Ching was about to become a major director in his own right, and his collaborations with To on the Heroic Trio films will produce some of To’s best pre-Milkyway films. After The Fun, the Luck and the Tycoon premiered in January of 1990, To would follow it up in the fall with The Story of My Son, his first collaboration with the man with whom his career would become intricately entwined in the Milkyway period: screenwriter Wai Ka-fai.